Looks like Kid Rock is taking a page or two from Donald Trump’s playbook. The “Devil Without a Cause” musician, who announced his intention to run for Senate on Wednesday, is already taking after The Donald and slamming the press for fake news. The “Greatest Show on Earth” video largely consists of live footage, replete with flashing females, interspersed with images of bikini models doing bikini-model things. The video for “Po-Dunk,” meanwhile .. well, if you’re a fan of pregnant women in belly shirts, gun-polishing and doorbells fashioned to look like dog’s anuses,this is probably your jam. Rock has been suggested as a possible Republican candidate to challenge Sen. Debbie Stabenow (D-Mich.), who was first elected in 2000. 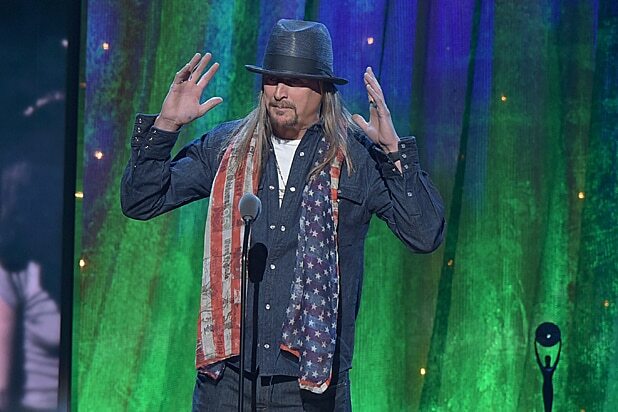 “I have had a ton of emails and texts asking me if this website is real… http://kidrockforsenate.com The answer is an absolute YES,” Rock tweeted on Wednesday. We’ll have to wait until next year to find out if Rock actually wins office. In the meantime, revel in the rural abandon of Rock’s new musical offerings below.